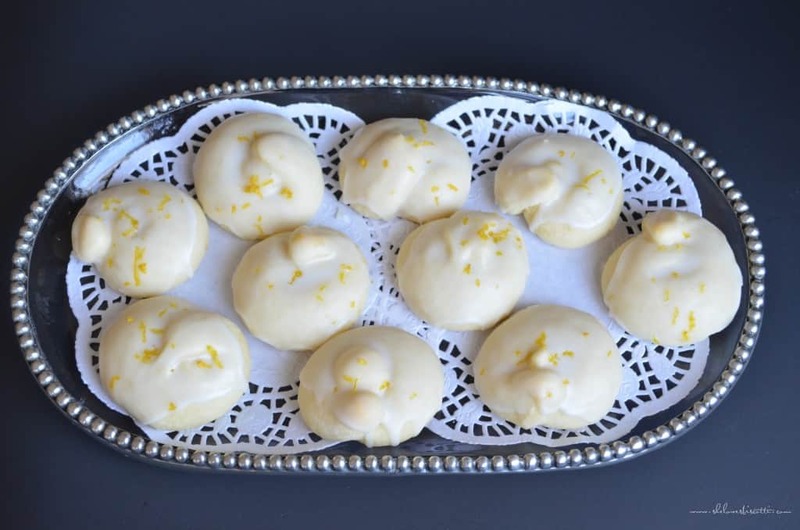 Italian Lemon Knot Cookies; Italian Wedding Cookies; Italian Lemon Cookies; Italian Lemon Drop Cookies; anginetti or more appropriately, tarallucci. As Shakespeare once said, “What’s in a name?” That famous quote from Romeo and Juliet still rings true today. It really does not matter what you call them. You can find them throughout the year, mostly at family gatherings and special occasions, especially Christmas. Just like Amaretti and Mostaccioli, these anginetti are, without a doubt, one of the most distinguishable Italian Christmas cookies. 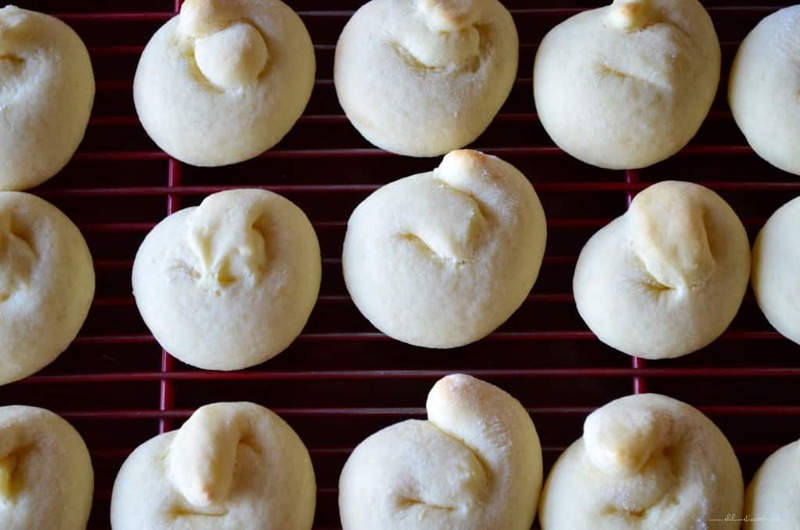 They are a drop cookie that has been formed into a “knot”. 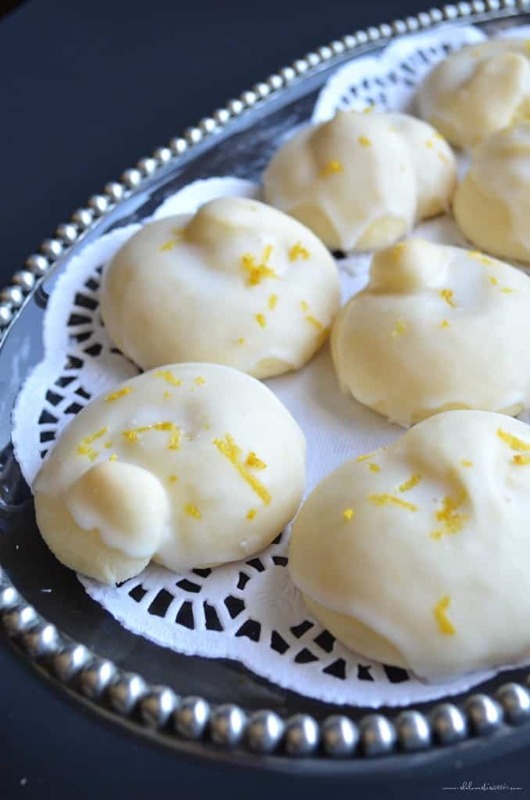 These Lemon Knot Cookies are lightly sweetened and glazed. 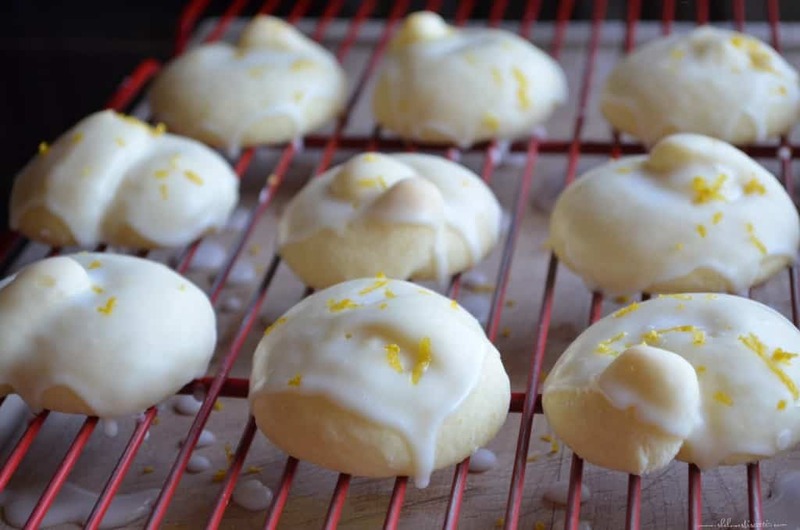 A quick glance at these cookies and your taste buds can already anticipate that burst of citrus! It’s simply one of the best Italian Cookies! Baking powder. This will help create a light cake-light texture. Eggs. Ensure they are properly whisked. Sugar. Provides the right amount of sweetness. Vegetable oil. Can also use canola or corn. Vanilla extract. If possible, pure. As far as accessories are concerned, a stand mixer (or handheld mixer) ensures the proper combination of the ingredients. A large bowl and whisk is required to combine the dry ingredients. A medium-sized ice cream scoop comes in handy in order to ensure equal sized cookies. A cookie sheet covered with parchment paper (or equivalent) is also required. The links on this blog are affiliate links, which means I’ll earn a commission if you use those links (there’s no charge to you). The first thing we’re going to do is whisk (or sift) the dry ingredients together in a large bowl and set it aside while we start mixing the liquid ingredients together. Using the whisk attachment of your stand mixture, beat the eggs for a couple of minutes until they are light and frothy. Gradually add the sugar and continue to beat for a couple of minutes until the batter is slightly thickened. Add the oil, milk, extract, zest and juice of the lemons and whisk together for a minute or so. Slowly add the dry ingredients and mix until properly combined. With the help of a medium-sized scoop portion and drop on a lightly floured surface. 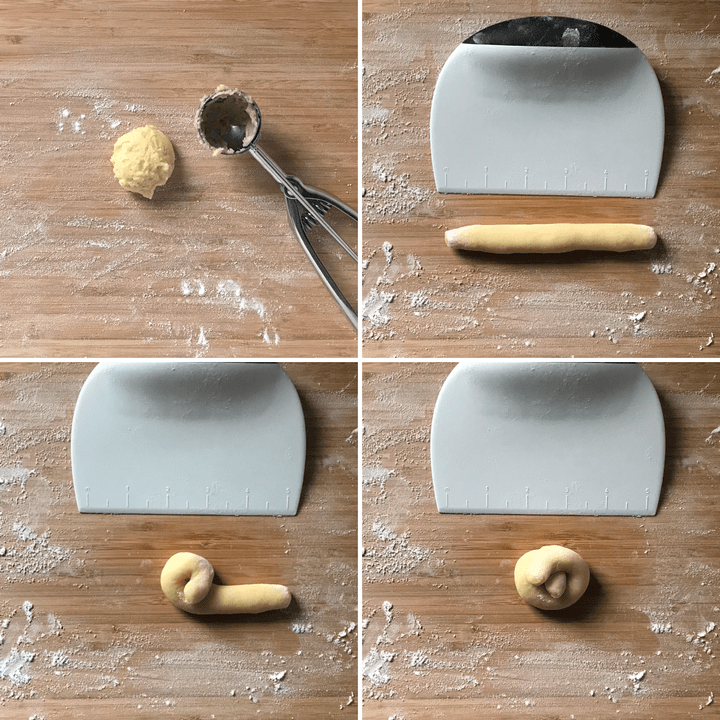 Roll the dough into a four to five-inch long strand, about half an inch in diameter. Gently place one end towards the middle, followed by the other end, in a way to slightly overlap each other. The secret to keeping this dough light and cake light is not over manipulating the dough. That is why these cookies give the illusion of being tied in a knot when in fact they are not. Notice the paleness of these cookies before they get glazed. 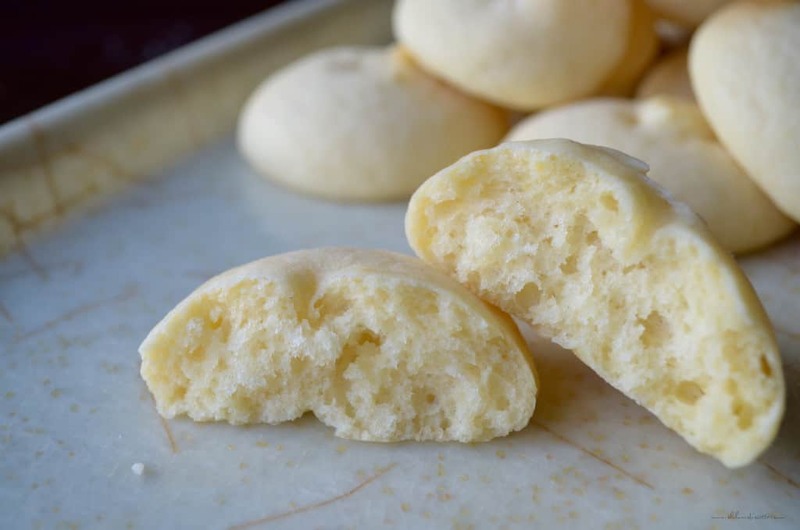 These lemon cookies have a really soft texture, almost cake-like. I have always associated these Italian cookies with the holiday season, probably because that is when my Mom would make them. I can still remember how quickly she would shape those “knots” with her fingers barely touching the dough. That’s probably why everyone loved her cookies, they were so light and airy and so so good. 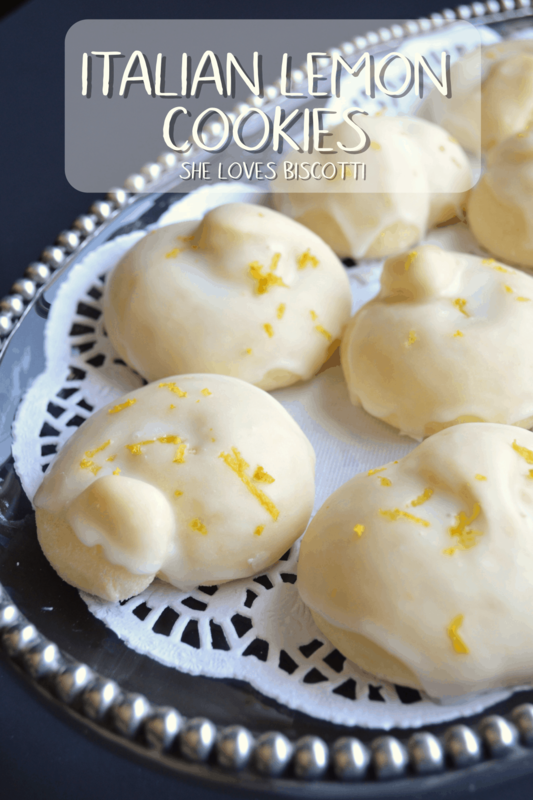 If you like lemon cookies, I have Another Simple Italian Lemon Cookie Recipe that I think you are going to love. This one is shaped into a twist! I hope you like both recipes! 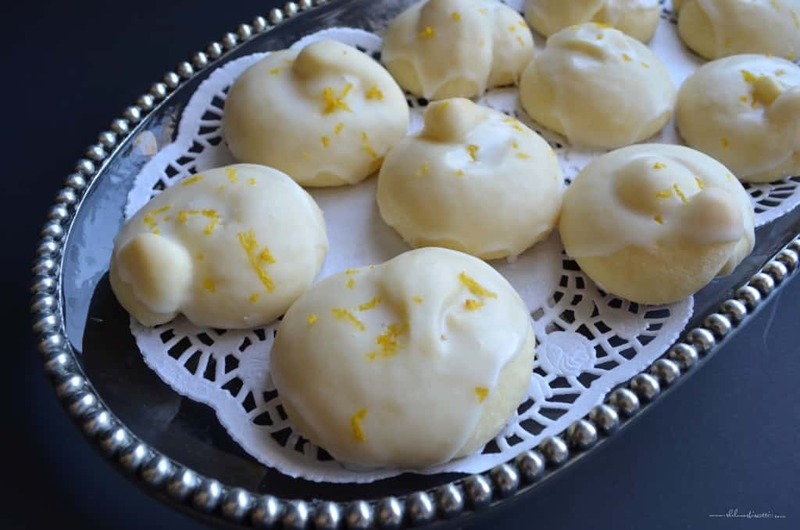 ★★★★★ If you have made these Italian Lemon Cookies, I would love to hear about it in the comments below and be sure to rate the recipe! 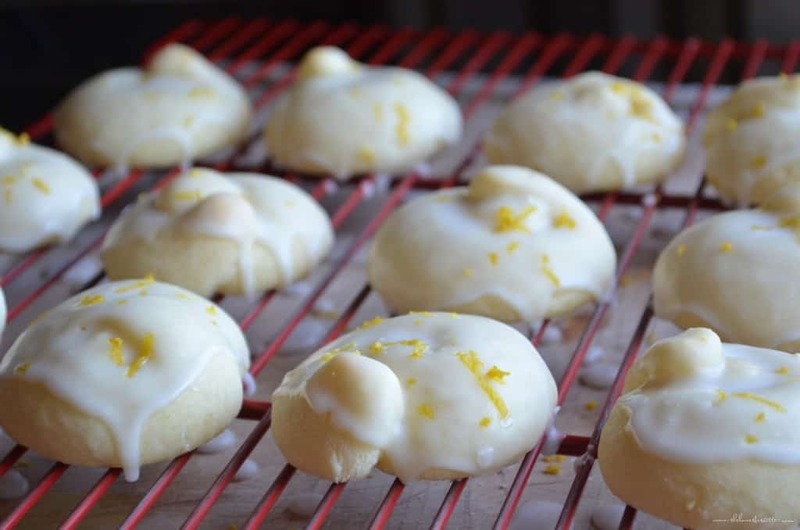 Traditionally made at Christmas, these Lemon Knot Cookies are a light and airy treat bursting with lemon flavor. It's one of the best Italian Cookies! Add sugar. Continue to whisk until well combined and slightly thickened..
Scoop dough with medium-sized cookie scoop and drop on a floured surface. Roll into a 4 inch strand about 1/2 inch in diameter. For the glaze: Combine about 2 cups powdered sugar, 1-2 teaspoons milk, and juice of one organic lemon. Adjust "thickness" of glaze according to personal taste. These are perfection! I made these and was transported back in time to my grandmother’s table. Mille Grazie for reproducing this Italian table treasure! How wonderful Grace! I am so happy to hear this. Thanks so much for taking the time to comment, appreciate it. My grandmother used to make these too, and no written recipe! glad to have come across them. The one thing I will tweak is I remember my grandmother used to use frozen lemon aid mixed with confectionairy sugar! Why so you not use butter or shortening? A couple of reasons… the first is that I wanted to document the recipes of my childhood the way they were made. Second, butter is a saturated fat; shortening usually has trans fatty acids, if it doesn’t, it has saturated fats… so ultimately the same thing. It is part of the heart healthy guidelines to reduce the overall amount of saturated fats (and trans fatty acids). I do a lot of baking and therefore prefer not use butter(or shortening). Can you please tell me what number for the cookie scoop. You said medium size, checking on Amazon, they go by numbers. You will want to look for size 40. These are delicious- soft and cake Like! My family says they are even better than my Mom’s. Thanks for this great recipe! Made these for the first time using your recipe. My family loved them!! The recipe was easy, and made just the right amount. The flavor was just right. Just wanted to say thank you for this delicious recipe. I will continue making these cookies every holiday!! Can I use Unsweetened Almond Milk so that the recipe will be lactose free? Unsweetened Almond Milk worked well to make these cookies dairy free. Easy to make. Just have to work on my shaping into a knot… lol… next time I’ll mix more lemon extract and less almond milk into the glaze… but definitely a new recipe to add to the grandkids’ file. My mother-in-law used yeast and baking powder in her version of this (we make truck loads of these at Christmas). Using yeast allows me to decrease the sodium content of the cookies by LOTS and the texture and height look identical to these! Hi, I am making this recipe (revised version) with my mom now but the batter is so wet. It is not dough, it looks like pizzelle batter. We have already added another half cup of flour. The lemon was standard size. Ugh. I don’t know what went wrong. Hi Kristin, I am sorry to hear… hard to say what went wrong… perhaps placing the dough in the fridge will make it easier to work with. Adding extra flour should help firm up the batter. Did it help? Hi all, if I make these tonight and place them in an airtight container how long will they last? today is Tuesday and im hoping til Sunday? Let me first say, these are delicious! I did refrigerate the dough for several hours and it helped working with it. 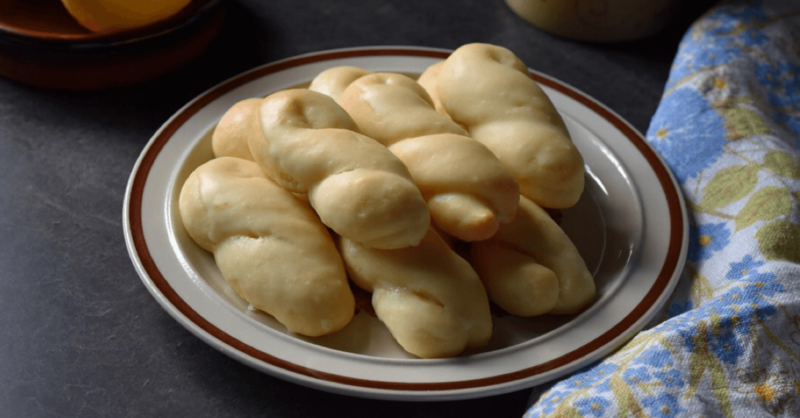 My only “complaint” is these are not tarallucci. I made them for my Italian boyfriend as a surprise because he said they were his favorite from home…. although he liked them, he said they aren’t even close to a tarallucci. Taralluccis do not have icing or a lemon flavor. Again, delicious recipe, but misleading name. Thanks for trying out the recipe! I’m very glad you enjoyed it – it’s one of my favorites! The thing to remember about Italian cooking is that it’s very regional: two completely different desserts from different regions may have the same name, and two completely identical desserts from different regions may have different names! That can lead to lots of miscommunication, and I’m sorry that that was the case here. Regardless, I’m glad you thought the cookies were tasty. Happy holidays! Taralucci actuality simply means buscuit, or cookie. It can be said “con lemeno” for this. So these can be called and are taralucci. That being said certain families may call a different cookie taralucci absolutely. Taralucci is like saying cookies in general, then specifically what type is different. There is a cookie known as the taralucci Abbruzzo or Abruzzesi from the region made with wine. That maybe what he was thinking of. Especially if from there. Can’t wait to make these cookies. Can you use whole wheat flour? Thanks! Hi Colleen, to be honest I’ve never made these cookies with whole wheat flour. If you end up trying it, be sure to let me know how it goes! That’s hysterical! Reminds me of my own children, ha. Kudos to you for trying it out – and who knows, it might taste good in the end! Good luck! 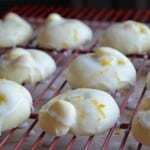 Ok well lets call them hearty lemon cookies. Lol. Making a regular batch today. 🙂 but really put that icing on anythinh and I would eat it! However, I would like to try your recipe because it looks like what we buy in Italian pastries and I like those because they are cake like. Can you please let me know, asap, if I can make them and freeze them without the glaze. Also, can I make these and put in a tin 2 weeks before Christmas and will they still be fresh? I put the dough in a plastic bag and cut off the tip, it was super easy to form the cookie! I’ve just tried this receipe, and my only regret is to not have tried the previous one first: those actually taste even better than they look! I’ve been reading this blog for a while just because it’s just very nice to spend time in your kitchen! Now, thanks to your receipes, and the unique way you have tell them, I think I can bake, probably cook, enjoy it a lot, and be proud of the result! I’m so glad I came across this recipe! 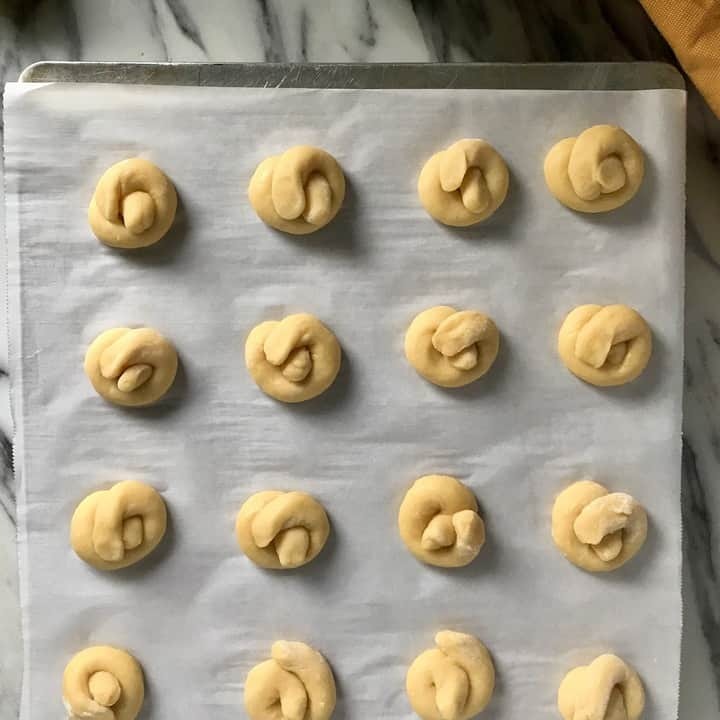 I’ve been searching for a lemon knot that my grandmother used to make (unfortunately no written recipe). I’m really looking forward to making these to surprise my dad. Hi got a question……….. can I use butter instead of oil?